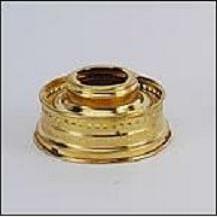 The Aladdin Lox-On Gallery (top) is a common replacement part for the Aladdin burner. Galleries can get dented, damaged, or go missing from the lamp all together. The Lox-On Gallery fits on Aladdin Lamp burners, Models 12, A, B, C, 21, 21C, and 23. This gallery (top) is designed for use with Aladdin Lox-On Chimneys #R103. The Aladdin Lox-On Gallery was originally introduced with the Model 12 burner, setting it apart from other kerosene and coal oil lamps on the market at that time. The unique Lock On style features a twist and lock design. The Lox-On Chimneys have three small tabs at the base of the chimney which corresponds to the three metal tabs on the Lox On Gallery. These tabs meet up to hold the Aladdin chimney securely in place. 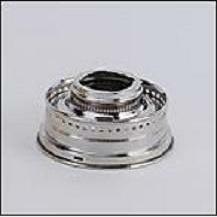 This nickel Lox-On Gallery can be used on both Aladdin kerosene and electric burners in Chrome, Nickel, and Silver finishes. This item has been discontinued by Aladdin and is limited to stock on hand. 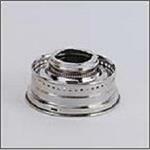 Convert your Lox On Burner to Heel-less and save on Chimneys.